Especially for those over 50 who are interested in learning or improving a foreign language with people from the same age, our partner schools developed language courses particularly for seniors. Most of the language courses for 50+ include activities and excursions like cooking classes, dance classes, sightseeing, and excursions to interesting places in the surroundings. The 50+ courses (Golden Age programmes) usually take place in springtime and autumn, a perfect period to take a language course abroad. Click at the links below to go directly to the language course of your choice. Go and enjoy the warm weather and the stunningly beautiful surroundings and cities of Spain in combination with a special developed language course for seniors. Enjoy pleasant temperatures of the autumn and spring in for example Málaga, Nerja or Sevilla. The Spanish courses consist of 3 or 4 lessons a day of general Spanish. The focus of the lessons is on conversation. Activities and excursions are added to the program, per destination there is a different program. Activities are for example: cookery classes, wine tasting or city walks. Follow the inks below to read more about the destination of your choice. The 50+ courses in Spain are offered in: Málaga, Nerja, Ibiza, Seville and Alicante. The English 50+ program is specialised in training the speaking skills. Furthermore the grammar of the language will be lectured and vocabulary and phrases of daily situations will pass by in the lessons. 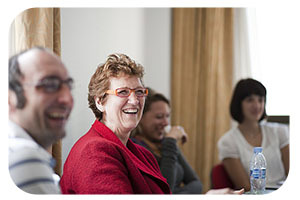 The senior language course exists of 3 or 4 hours a day in small international groups. 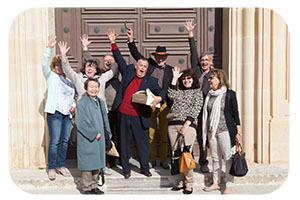 In for example Nice and Biarritz, French language courses are offered of 15 hours a week. Senior students can learn a language in a relaxed way with students of the same age. Speaking skills are trained by doing role- plays. Furthermore recent media is used in the lessons like video, magazines and papers. To read more about the destinations and the courses have a look at the destinations by following the links below. Especially for people of 50 years and more are language courses developed in groups with other seniors. Grammar, conversation and the daily use of the Italian language are taught in the lessons. The conversation part in the lessons is the most important element of the course. It is possible to have 3 or 4 hours of classes a day. The program can be extended with an activity or excursion program. Please choose your destination by following the links below.